So glad to welcome back Kristofir and Christopher who are the brains behind Vegiterra. Their last post was a tasty recipe for Crunchy Sweet Potato Gnocchi. What is their blog about? Here they are in their own words. Check out Vegiterra on their blog, Facebook, and Twitter. Welcome Kristofir and Christopher! On a routine trip to the Asian market I stopped in my tracks as I read a label “Sweet Basic Seed.” Basic seeds? I had to buy this! Not knowing what it was, I brought it home and looked all over the internet to help identify these mysterious black dots. It turns out that these were in fact basil seeds, and the person writing the label switched the “l” for a “c.” We all do it – it’s fine. I was excited and eagerly searched for information. Basil seeds act very similarly to chia seeds, and are also full of nutrients such as potassium, maganese, calcium, copper, magnesium, folates, and vitamin C. In addition to minerals, the seeds aid in digestion and provide relief for upset stomach and cramps; help treat colds; are a stress reliever (as is basil essential oil when used in aroma therapy, so eat a lot of pesto when you are stressed out); aid in skin infections when crushed and applied to cuts. They are considered to be super foods by some and delicious by others. They are sometimes called Falooda and appear in Arabic influenced drinks and desserts from the Middle East, through the subcontinent and into southeast Asia. This is where I first tried the seeds, and I was massively impressed by their texture which is reminiscent of bubble tea when in a drink. 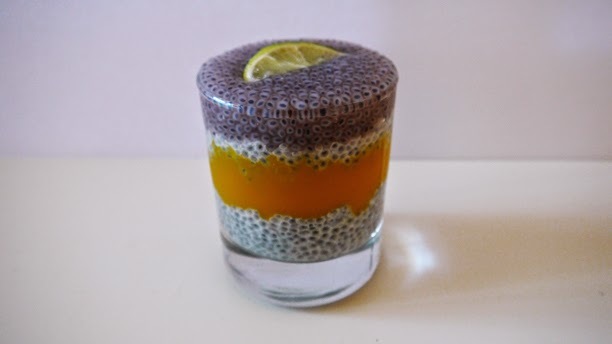 Basil seeds can be used as a replacement in any chia seed recipe. The seeds plump up in minutes, whereas chia seeds can take hours, so it is a good option if you are in a rush. They also take on the flavour of whatever you soak them in. In this recipe, they are soaked in a mixture of coconut milk and lime zest, giving them a fresh, tropical taste. In a medium-sized pot, heat the coconut milk, vanilla, lime zest, and syrup for 3 minutes on a gentle simmer. 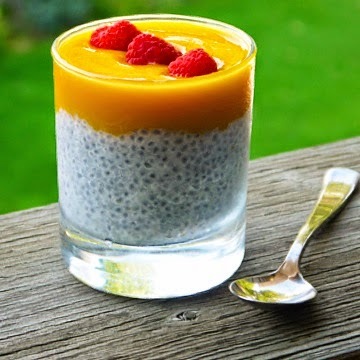 In glass jar, or mixing bowl, add the basil seeds, and pour the coconut milk mixture overtop. Stir for a few seconds and let stand for 5 minutes, then stir again. At this point the seeds will have grown and you should have a pudding texture. Chill, or eat warm as is with layers of fruit coulis.